Hey, you. Yeah, you – Mr. Thrifty. 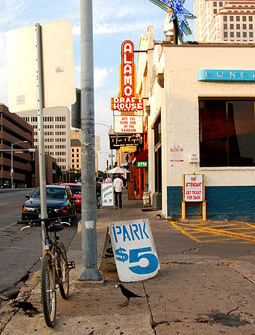 Grab a friend (or an even number of pals) and eat cheap all week with these fabulous two-for-one deals and bargain meals in the ATX. After 3pm, you and a friend each get a platter of fajitas for a mere $8.99. If you’d like a side of entertainment to go with your meal, check out a music-related film every Monday at 9:45pm for $2 (or $1 for students/seniors/AFS members). Food and drink specials: You’ll get a free large popcorn with the purchase of a bucket of beer, and a free large soda or #2 Alamo Ale when you buy a pizza. From 6pm to 10pm, you’ll get two pepperoni pizzas for the price of one. 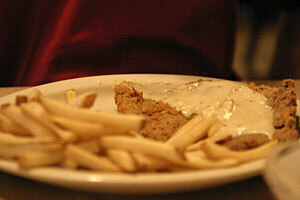 Two-for-one chicken fried chicken or chicken fried steak when you and a pal show your student ID cards. Note that this deal is only offered at the North Lamar location. Enjoy two-for-one burgers at Hut’s from 6pm to 10pm. Sure, Sandy’s has some fantastic custard, but you might as well grab some non-frozen treats if you’re going to stand in that line for a thousand years. $2.50 will get you a cheeseburger, fries, and a soda. Z’Tejas has half-price appetizers from 5pm to 7pm Monday through Friday, but you might as well save this one for Friday – it rules. Any appetizer on the menu, including catfish beignets, grilled jumbo quesadillas (with chicken, pork, or veggies), and pork and black bean nachos, is under five bucks. The plates are big enough to split between two or three people, too, so order a few and share ‘em. No drink specials, but the margaritas are very strong. 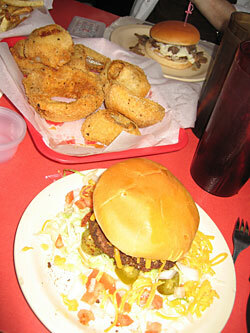 Sandy’s $2.50 cheeseburger/fries/soda deal is so good, why wouldn’t you do it twice in one week? Tap that. 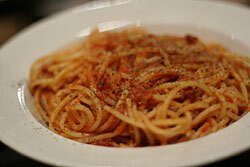 From 6pm to 10pm on Sundays, stop by Frank & Angie’s to take advantage of their two-for-one spaghetti with marinara deal. has a great happy hour if you are hungry. They put out: Chips, queso, ground beef, beans, pickled jalepenos, 2 salsas (the pico-ish one, and the strange katsupy one with carrots that I never see anyone eat.) You can also get an order of tortillas for like 1.50$ and make your own little tacos… and margaritas are 3$ and i think domestic beers are 2.50$ Beware, Mexican beers are not discounted. Discounted “Sharable plates” aka appitizers - they are 5$ each and some are really good especially the shrimp flautas. Specialty Drinks are 1/2 off. Look for a lil martini glass on the menu to help indicate what is on special. 1.50 Drafts w/ buffett purchase I think the buffett is like 6$ and comes with one beer- the pizza could be better, but as far as buffett pizza goes, this is much better than usual. Free Pizza on Mangia crust. The beers are normal price, but the pizza is free! There is usually a line for it- just one dude sits there and cooks them 1-2 at a time, you wait in line with your beer and out pops free pizza every 10 mins or so. The guy doesn’t really take suggestions for toppings unless you tip him (which is understandable) and sometimes he comes up with some interesting combinations… one became one of my favorites- jalepeno and pinapple. You just can’t go wrong with free pizza, and this is actually pretty good quality.